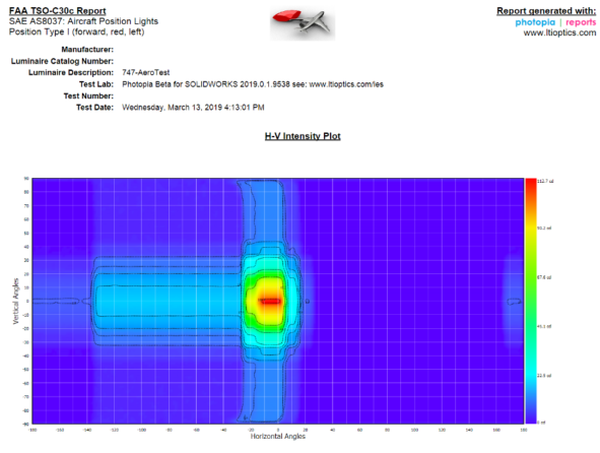 Open SOLIDWORKS and open an assembly you would like to analyze. Add the appropriate light source and assign appearances to the optical parts. 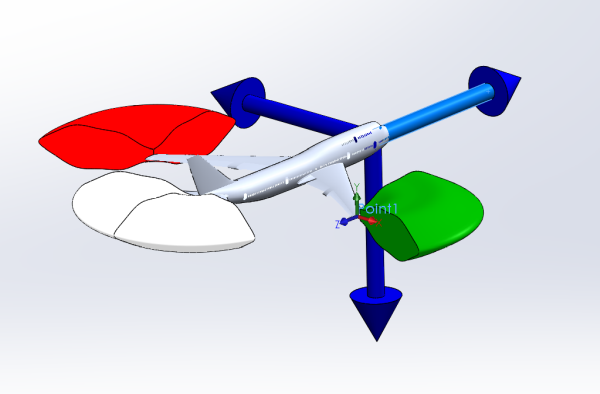 Add a Reference Point at the exit surface of your optic by going to Insert > Reference Geometry > Point. 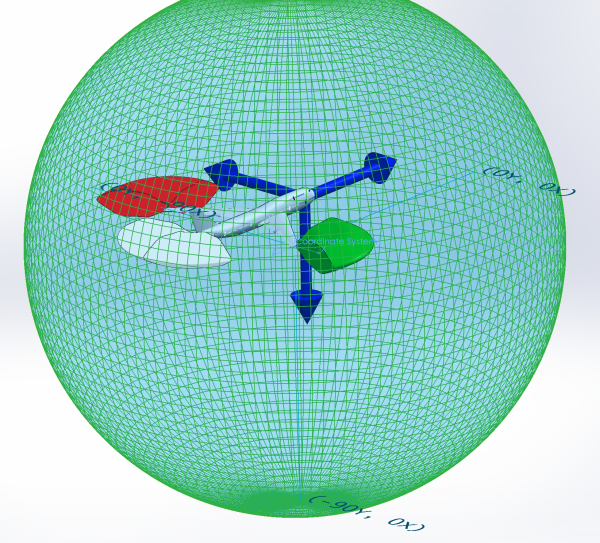 Add a Reference Coordinate System by going to Insert > Reference Geometry > Coordinate System. For the origin select the point you defined in Step 3. 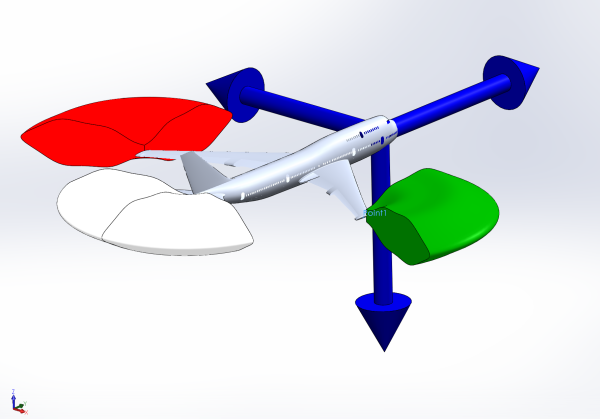 The +Z axis should point towards the aft of the aircraft. The +Y axis should point up with respect to gravity. 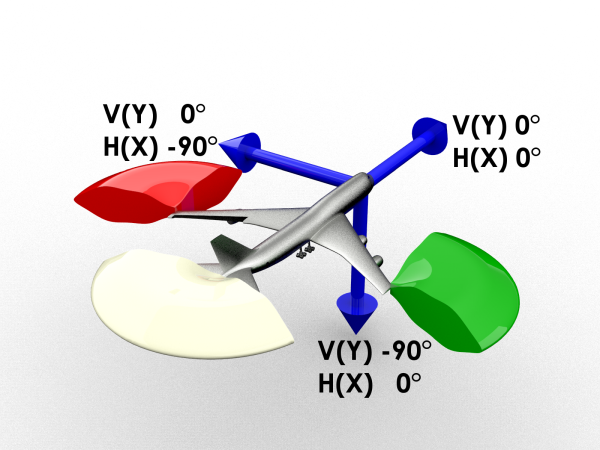 Click OK to add the coordinate system. 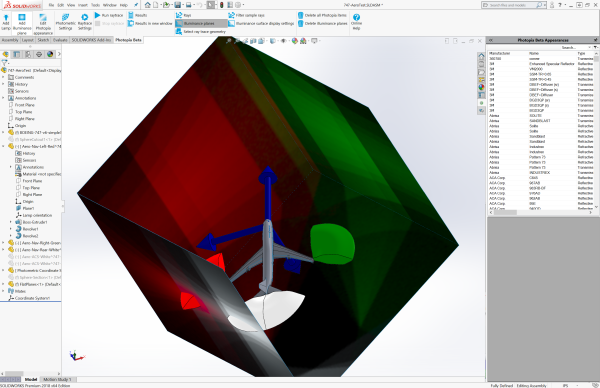 Select the new coordinate system defined in Step 4. Select Photometric Settings in the Photopia CommandManager. Change the Photometry Type to Aerospace/Automotive. Ensure the Photometric Type is Type A. Set the Horizontal angles from -180 to 180 in 5 degree increments [-180(5)180]. Set the Vertical angles from -90 to 90 in 5 degree increments [-90(5)90]. As long as your Reference Coordinate System was oriented properly, your Photometric Coordinates should match the images below. Click OK to save the Photometric Settings. Select Raytrace Settings in the Photopia CommandManager. Keep the default of 2.5M rays and 25 ray reactions. Click OK to save the Raytrace Settings. Select Results in the Photopia CommandManager. In the Results window, choose the IES File section and then click on the export button in the upper right to save the IES file to disk. Open photopia|reports and browse to the IES file, or right click on the exported IES file and choose Open. Choose IES Report from the left menu and then choose any of the 4 FAA Compliance Reports from the thumbnails. The first page of the report contains an intensity plot that shows the distribution. 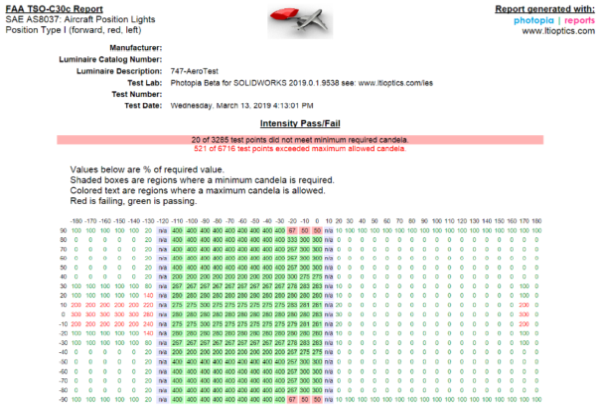 The second page of the report contains a simplified intensity table which shows the % of target candela along with a pass/fail indication both for minimum and maximum candela locations.